A few weeks ago I proposed that Eliza had modified her journal. I also proposed that it would be very hard to discern if her journal had been modified. Looking at the manuscript, I can see that my original hypothesis about how the manuscript was modified does not stand. But the journal entry was clearly modified. The ink used on September 18th is the same as the ink used before December 12th, making a possible modification in November plausible. Let me explain, and then we can see what you think. / Eliza R. Snow journal, 1842-1882 / Snow, Eliza Roxcy 1804-1887 / MS 1439 / Microfilm / . Your digitization request is complete. Please click on the link/s below to access the materials. Below is an image of what I think the journal might have looked like originally. I have digitally altered the image. Eliza tended to leave nice gaps between her poems and the rest of her writing. Titles, while not always separated by a line from the poem, are usually separated by a line. You can see that as you read the rest of her journal. There are numerous dark letters and portions of letters. While some of these appear to have been produced by a rough quill, others are clearly instances of Eliza re-writing letters. In the presence of the sun. But it appears rays was not the original word. Perhaps other letters were darkened to make it less obvious that “rays” wasn’t the original word. Or it could be that after writing angels, Eliza realized that didn’t scan as well as a single syllable word. What is this journal entry about? She then writes a beautiful poem about eternal marriage. We know when Joseph Smith asked Joseph Kingsbury to stand as a pretend husband to Sarah Whitney, he promised Kingsbury eternal union with his deceased wife, Caroline. It is possible that Joseph Smith had talked with Eliza and Jonathan about Jonathan standing as Eliza’s pretend husband, with the promise that Jonathan would be eternally united with his deceased wife, Marietta. An eloquent discourse on the literal resurrection of the dead could very well have prompted Eliza to write a poem celebrating the eternal union of her friend Jonathan with his deceased wife. In this case, “angels” would be an appropriate word for the second stanza, as one of the two was already an angel, and the two would not be united until they were both beyond mortality. I had originally proposed that “& Elvira” was added to a “To Jonathan” that was already written. Looking at the journal, it is clear that “To Jonathan & Elvira” was written at the same time. But it seems entirely cramped the way the “To Jonathan & Elvira” is jammed between the title and the first stanza. If the poem is written to Jonathan and Elvira, the word “angels” had to be replaced. Eliza would also have to explain why this poem is in this journal entry, which she proceeds to do in a manner that is located in an awkward location on the page, but which draws attention away from the fact that the dedication jams the title and first stanza together. 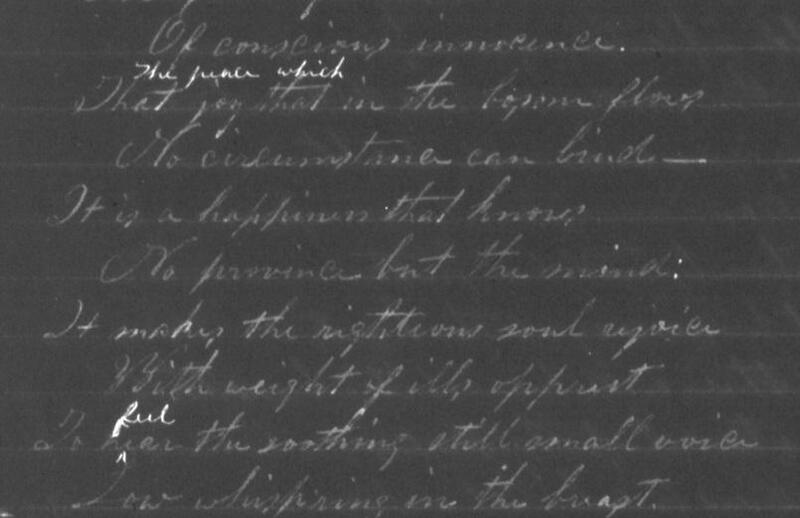 I think a study of the manuscript of Eliza’s journal shows that this journal entry of September 18, 1842, as currently extant, is within the parameters of reasonable variation given the rest of Eliza’s writings. However I do not think the extant form of this entry is completely above suspicion of having been tampered with prior to 12 December 1842. It is good you got the photocopy of the manuscript even if it failed to support your initial theory but added to the mystery with other possibilities. I think it’s a fantastic journal, and am glad it finally got through digitization. I particularly enjoyed seeing her Patriarchal Blessing written out (p60). I almost wish this could rate as high as the other papers going through the JSPP, so we could get more information on the provenance of it. Someone wrote in pencil in various places, and someone else made a typed copy (the second half of the digital record). Could it be that this isn’t the original diary, but a copy of what she (or someone else) found interesting? There are such huge gaps! I have such a love/hate relationship with history. I love finding out new things, but I hate not being able to be sure of where the truth actually lay. I think the journal is still consistent with my theory writ large, though the particulars of the modification weren’t what I thought they would be. I would love to have someone analyze the word under “rays” and determine what it was. My guess of “angels” is speculative, but it appears it should be possible to determine what the word actually is, and identify if Eliza ever used that method to “correct” any other part of her journal. I attempted to clean up the photo with some software, but I didn’t get very good results other than just a simple inversion of the words around “rays”. Eliza’s terminal s sometimes looks like a p. One of the better examples of this is the terminal s in “looks” on the bottom of page MS 1439_f0001_00017.jpg. Found an instance of “angels” on page MS 1439_f0001_00039.jpg. Stretching it ever so slightly to match the more loose and elongated hand of the Conjugal poem, we see that the stem in the g for angels lines up with the stem in the y for rays. I also pasted in “looks” so you can see the striking resemblance between the terminal s in looks and the letter that has been scraped off of the paper under rays. Finally, here is an example from MS 1439_f0001_00015.jpg of the way Eliza typically edits her work – by writing the new words above (versus on top of) the original. Also note that sometimes Eliza’s s looks like a p at times even when it isn’t the final character in a word (the words “bosom” and “breast”). In attempting to explain this to my husband, I realize that most people won’t get why Eliza’s edit of her poem is explosive. Now we take it for granted to any man may be sealed to his departed spouse. But in 1842 this was bright new doctrine. The first documented instance of this was the public marriage of Sarah Whitney to Joseph Kingsbury, for which service Kingsbury was granted the great blessing of being sealed to his departed wife for eternity. But the Kingsbury journal entry is many months after this poem in Eliza’s journal. Eliza’s use of the term “angel” is also very specific. It is not just a happy word thrown around lightly, as in “You’re an angel for doing that for me. Thanks!” Rather, in Eliza’s writings, angels were specifically beings from another sphere. Granted, it might have merely been that Eliza decided “rays” fit better in the poem from both the standpoint of scansion and imagery. But then why scrape the original word off the paper? She doesn’t do that elsewhere. Even in the High Council notes regarding truly terrible stuff, “redacting” problematic testimony (e.g., the account that Joseph’s brother, William, tried to get it on with Catherine Fuller) is done merely by drawing a line through the offending text. What could possibly be the reason for Eliza writing a poem about eternal marriage in that era? These things were not spoken of openly. Joseph Smith’s Emma was not yet an angel, in Eliza’s vernacular. She was writing this poem to someone who had lost a spouse, and this was someone to whose intimate eternal business Eliza had been privy. Arguably there would have been no reason for a widow to have confided such a powerful secret. So that leaves us with a widower. The only purpose for Eliza to be informed that a widower had been promised eternal union with their departed spouse would have been because she was to be part of the mortal sacrifice the man was performing that would “earn” such a great blessing. The man marrying a woman who needed a public husband would be the kind of mortal sacrifice in 1842 warranting the great blessing of being sealed to his departed spouse. I can imagine such a blessing being offered to Brigham Young for marrying Lucy Ann Decker, but neither Brigham nor Lucy wrote anything about the marriage, as far as I am aware. From the standpoint of Mormon eschatology (beliefs regarding death), this poem is a fantastic find. And because I’d only ever seen the typeset copies of this poem, there was no way I could ever have suspected “angels” was the original word in the second stanza. This obvious modification fits the hypothesis that Eliza was being asked to accept a widower as public husband. It’s a far better fit, in fact, than my original idea that Eliza would write such a poem as celebrating her own pending marriage to a public husband, simply because it strains credulity that Eliza would have “lied” about the nature of her relationship with a public husband by characterizing it in these exquisite terms. But she could certainly celebrate the promised union of a man with his departed spouse in these glowing terms. And such a poem would signal her willingness to be part of the mutual mortal sacrifice that would bring about the promised eternal union. When circumstances changed, eliminating the need for Eliza to have a public husband, the poem as originally crafted (with angels in the second stanza) was a problem if Eliza wasn’t married to the widower in question. Ah yes, that seems to me that it is definitely an ‘s’ now. Also, ‘angels’ seems to fit pretty close except for two parts: what looks like a taller character protruding above the ‘r’ and ‘a’ in ‘rays’, and what still looks like an ‘i’ before the final ‘s’ (it seems too short to be an ‘l’ [el]). If you look at the inverse of the opposite page, it’s clear the “taller character protruding above the ‘r’ and ‘a’ in ‘rays'” is bleedthrough from the other side. This suggests the paper was abraded rather severely to eliminate whatever word we are looking for. So now we’re down to the fact that the remaining artifact before the ‘s’ seems too short to be the L in angel. However the dot needn’t be the top of the L, but the portion of that letter that was darkest in the original. Which could be the quill catching on the paper a bit strongly at that portion of the loop. If we look through the rest of Eliza’s journal, we see various places where it’s clear the quill caught and dumped a disproportionate amount of ink on ‘lower’ portions of a looped letter. For now, here’s a link to the image showing the portion of the poem we’re examining and the reversed image of the opposite page, so you can see the mark that is bleeding through. Very observant! I hadn’t thought to look at bleed through. Thoroughness is a trait I admire and aspire to; thank you for humoring me in your analyses. As far as the remaining letter ‘L’, I have found several examples of where that letter does indeed have more ink towards the center of it, and I can see how it is possible that erasing just left the heavier part. The only other observation is that it looks like that this letter is better erased than the rest: there is almost no trace of it, unlike the other letters we see. But this could be due to any number of things such as writing the ‘L’ lighter or the other letters heavier, or even rewriting some of the other letters originally. As far as a disproof for the ‘i’, it looks as though Eliza write the dots of her ‘i’s much higher than is shown here; so I don’t think it is an ‘i’ anymore. I think she wanted to obliterate the original word without eliminating the adjacent words. On the front part, she may have scraped off part of the o in two, hence the re-inking on that last letter. I think she did a very thorough job of obliterating the letters in the middle of the word. Now the question is whether there are other words starting with either a or o that could have made sense in that poem. And if the word wasn’t angels, what could the word have been that Eliza felt the need to scrape it off the page.